Batsheva Dori-Carlier’s poetry deals with family and relationships. Her debut book, Soul Search details the evolution of a love, from a first meeting to marriage, maturity and even couples therapy. The PTC first translated her work earlier this year, tackling a poem called Red Kubbeh, that neatly fits an investigation of family, time and exile into a simple meal: a rich beetroot soup. 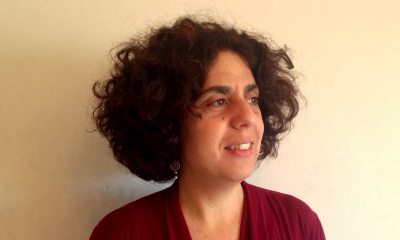 Introducing Batsheva’s work is Micha Meyers, a teacher and translator who has led previous PTC workshops on Hebrew poetry from the new wave of Mizrachi poets from North African or Middle Eastern backgrounds. Batsheva Dori-Carlier (1970) was born in Jerusalem to parents who left Iraq in the 1950s. She studied German Literature, History and Philosophy at the Hebrew University of Jerusalem, and at the Freie Universität in Berlin. A graduate of both the Helicon (Tel Aviv) and Poetry Place (Jerusalem) workshops, she edits and translates poetry from German and Dutch. For the last five years she has been teaching Hebrew Literature to English speakers, and has led creative writing workshops. Micha Meyers is a secondary level teacher and translator who lives in Hackney, London. He studied at University of East Anglia (UEA), The Hebrew University of Jerusalem and the University of Groningen. He is a regular participant at the PTC workshops and in 2018 provided bridge translations for a workshop on the Hebrew 'Ars Poetica’ poets.